Using a strong flashlight shining at a low angle, examine dusty areas of your floor. You may find rat or mice tracks near your walls. You can also sprinkle flour or baby powder over a small stretch of floor and check it for tracks the next day. Pick a spot against a wall. Because of their poor eyesight, rats and mice hug walls and move along established paths to access food sources and find their nest. Their bodies will leave dingy traces of dirt and grease along the wall. Rats and mice follow established paths outdoors as well. These tracks, called rat runs, are worn into low vegetation and grass. Brown rats prefer to live outside and will often have runs between their burrows and your home. You can spot their burrows beneath tree roots, around sheds, under decks and in compost piles. Mice on the other hand are totally at home living inside. Black rats, sometimes called roof rats, as well as mice prefer indoor nesting spots that are close to food but infrequently disturbed. This could be any from behind a fridge to in the attic or a crawl space. They may shred paper and fabric items around your home for nesting material. 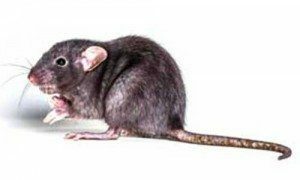 Rats and mice can be highly destructive and will gnaw on plastics, wood and even metal. Their teeth leave large, rough gouge marks. Holes in floorboards and walls are a clear sign of infestation. Rats and mice will also go after food and pet supplies. While you wait for your pest control appointment, put dry food in metal or thick plastic containers. Rats can still chew through them, but it can slow the spread of the damage.